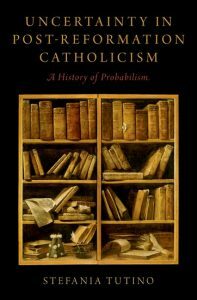 Within a century of its origin, probablism became closely with the Jesuits. Chapters in this book focused on the Society of Jesus include an examination of the “theoretical cornerstones” of Jesuit thought as well as the debated within the Society about the case of Honoré Fabri, a seventeenth-century French theologian and scientist. A proponent of probabilism, Fabri was the author of, among other titles, Honorati Fabri, Societatis Jesu, apolgeticus doctrinæ moralis ejusdem Societatis (1670, 1672), the second edition of which was placed on the Index of Forbidden Books. More information about Uncertainty in Post-Reformation Catholicism is available on the Oxford University Press website.